Known as “Lord of the World,” the bodhisattva Avalokiteshvara is revered for his compassion. According to Buddhist doctrine, he vowed that his body would break into pieces should he stop his efforts to save all sentient beings. Throughout the Buddhist world, Avalokiteshvara appears in a wide variety of forms, sometimes with multiple heads, and as many as a thousand arms. Here, his missing hands once carried identifying symbols -- a rosary, an open book, a lotus and a pot. Only one mark of his identity remains intact, a small Buddha seated in his bound hair. This is Amitabha, the head of Avalokiteshvara’s family. By the 11th century, when this sculpture was made, Buddhism recognized many bodhisattvas who were organized into families headed by Buddhas. If you look around the room, though, you will recognize a distinct Cambodian style. 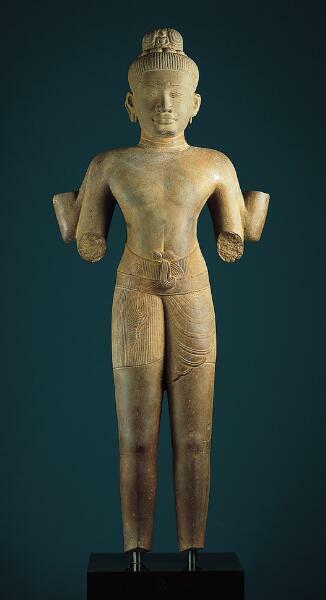 Cambodian images of gods are generally formal, stand upright and are sparsely adorned. They are sculpted with simple forms and smooth, broad surfaces, and, unlike most Indian sculptures, are carved in the round.